I used to live in Missouri and spent a lot of hours hiking and canoeing the Ozarks. I miss those days. Thanks for stopping by my place. We are looking for writers by the way. No rules, write when you want, and what you want. If interested use the "contact" link at the top of my page. Regardless I hope you stop by again. Thank you for the visit, Michael. I enjoy the posts at madmikesamerica.com & you really have a vibrant and active bunch of folks leaving comments. Missouri is a lovely state for canoeing. We love paddling around Noel, Pineville, & Eureka Springs. Can't wait to see more of the waters in Missouri. 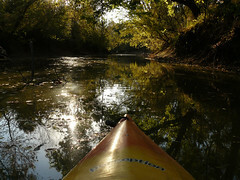 For me, paddling is the perfect way to experience rural America...politics.. uh, not so much.